Charles Nichols, aka William Morgan, aka Al Biscaro, was, on December 13th, 1920, sentenced to eight to ten years in the Wyoming State Penitentiary for the admitted crime of Grand Larceny, and was delivered to the prison on December 20th. Before the final conviction, Biscaro had already created for himself a substantial reputation as a violent and unsavory character having already served three prison terms earlier: one in Wyoming, one in Colorado, and one in Montana. 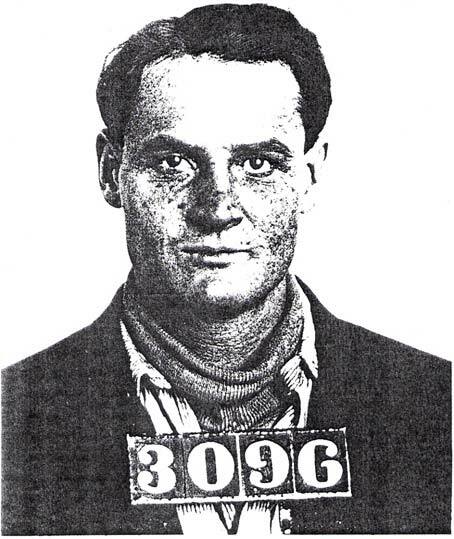 Biscaro had already created for himself a substantial reputation as a violent and unsavory character having already served three prison terms earlier: one in Wyoming, one in Colorado, and one in Montana. Due to this and his general living habits, he was considered dangerous at all times. However, during his final stay at the Wyoming State Penitentiary in Rawlins, it seemed he had turned over a new leaf. The Warden even regarded him as a “model prisoner”…whatever that may entail. Regardless of the reason for the good behavior, because of it, the prison staff was genuinely surprised by the brash manner in which Biscaro made his escape. At the end of April in 1921, four months after his incarceration, Biscaro had come down with a case of appendicitis and underwent surgery by Dr. Barber to remove his appendix. The operation was a success, though he remained weak for quite some time, and remained in the infirmary well into May. On the 16th of May, he requested a meeting with either Warden Hadsell or Deputy Warden Kiefer as soon as it was convenient. According to both, they had other, more pressing, matters of business to attend to, but said they would have complied at a later time. Also on that Monday morning, Dr. Barber, the same doctor that had operated on Biscaro weeks earlier, and a Mr. Rich Magor came into the prison to do some work. Later that day, Mr. Magor went to the infirmary to wait for a ride back to town from the doctor. Biscaro was still being held in the infirmary. Biscaro pulled out a revolver and held the two men, including a guard and seven convicts, at gunpoint against a wall. He sent the guard to tell the Warden his demands: that all the guards be removed from the walls, and that a car containing four women be brought to the infirmary door or else the doctor and Magor would die. Barber and Magor talked the man out of the women and asked him to settle for them instead, which he did. The Warden complied (for the most part) by clearing the walls and by ordering that no guard attempt to shoot the man until he was at least two blocks away from the prison. He then loaded the two onto Dr. Barber’s car, which was near the infirmary door. After a failed attempt at driving himself and nearly killing the two, he had Barber drive at gunpoint, right out of the Sally Port. Once the posse caught up with him and began searching, three gunshots in quick succession were heard. Once Biscaro had obtained the agreed-upon distance between the prison and himself, a posse was formed to retrieve him with the Warden driving the lead car. Biscaro, knowing he was being followed, kicked Magor out of his car at forty-five miles per hour, and told him to send the message that unless they stopped following him, he would kill Dr. Barber. Magor escaped essentially uninjured. Dr. Barber, however, “knowing” Biscaro had no intention of letting him go, purposely wrecked the car, and ran away, nearly being shot several times. Biscaro then ran into a nearby ravine to hide. Once the posse caught up with him and began searching, three gunshots in quick succession were heard. Biscaro’s body was found shortly after with one bullet lodged in his heart and another in his head. The third bullet was never accounted for, and the death was presumed suicide. Cited: The Rawlins Republican: May 19th, 1921.